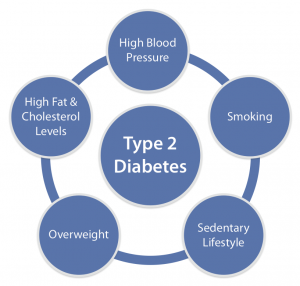 They are mentioned together all the time, but obesity and type 2 diabetes are not the same health issue. Over thirty percent of those suffering from obesity with never develop diabetes, and people with type 2 diabetes are still normal weight. There is a term often used to describe the correlation between the two conditions: “diabesity”. Being overweight always raises the chance of developing other health problems- sleep apnea, cancer, arthritis, heart disease and yes, type 2 diabetes. Over the last few decades here in the United States and other developed nations obesity has become far more common, frighteningly so. Statistics now show that over one third are clinically overweight, and another third considered obese, this means over sixty five percent have reason to be concerned. It is incredibly difficult to maintain healthy body weight for so many people it is an epidemic. The availability and marketing of processed food, super-sized portions, and the lack of activity in the modern lifestyle all play a role. There are a few basic guideline to follow if improving this situation is of interest to you or a loved one.